All month my head has been spinning with the constellation of scandals that won’t seem to go away. Benghazi, the IRS targeting of conservative groups for exclusion from tax-exempt status, the NSA and their lists, the eye-brow raising intrusions into journalists’ phone calls and emails, all of which make one think that certain freedoms from government intrusion are becoming something historic, while getting fully disclosed information from the government becomes almost impossible. We have already forgotten Fast and Furious, because there is only room for so many simultaneously operative catastrophes. After all, all we need is Hilary Clinton stating “What difference does it make now?” and the truth seems devalued, a messy inconvenience that can be tossed aside in the power plays of articulate politicians. These scandals, no matter what side of the aisle you are on, are so disheartening that it makes most Americans just want to look for the exit. These scandals are really not so different from one another: they are all symptoms of some kind of common denominator that is part of the governmental status quo. But it would take a detective of the highest order to figure out the ultimate truth: does this administration think that they can hide various ill-conceived machinations, or do they just not have a handle on what they are doing, thus having almost every imaginable scenario spin out of control? I know: it’s a tough call. Just be glad you are not Jay Carney: he is the lucky guy who gets to explain it all. It makes me wish for an American equivalent of Scotland Yard. Or better yet, Sherlock Holmes. It makes me wish for someone brilliant and reasonable who can see through even the most dissembling statement, see through to the truth, come to a reasonable conclusion, wrap up the investigation, put the bad guys, or gals, away for good. Someone who can make the curtain drop at exactly the right time, exposing the true motives for malicious or incompetent actions for all the world to see. Just as it might be when reading a Sherlock Holmes mystery, you don’t even mind if you couldn’t figure it out first: you are just glad someone had the mental dexterity to figure it out at all. Luckily, I was able to indulge this wish for a few hours on Tuesday night when I went to The Alley Theater in Houston to see playwright Jeffrey Hatcher’s “Sherlock Holmes and the Adventure of the Suicide Club.” This play cleverly draws from both the Sherlock Holmes mysteries of Sir Arthur Conan Doyle and the detective fiction of Robert Louis Stevenson. In other words, Sherlock Holmes is the detective in a plot originally devised by Stevenson, and reinterpreted by Hatcher for the stage. The main reason I wanted to go was to see Todd Waite, one of my favorite actors at The Alley, and I am saying right now that they really cannot ever replace him, because he is so convincing as Holmes that I don’t think anyone else should ever play him other than Waite on that Alley Stage. He is now my Sherlock Holmes, and I don’t care if Leonardo DiCaprio offers to step in. No one else will do now. The plot is complicated, the twists satisfying, the subject macabre: I don’t want to give too much away. 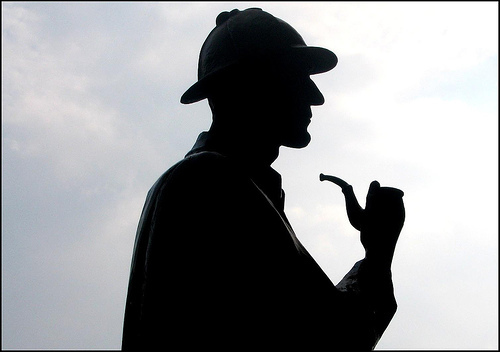 But I can see why Holmes has persisted in the popular imagination: we need our avenues to justice, whether watching Todd Waite as Sherlock Holmes on a theater stage, or watching a television show called “Elementary.” We want the falsely accused to be vindicated, we want the guilty to be exposed. We know there are crimes on this earth, and we want them solved. The playbill reminds me that Sir Arthur Conan Doyle was originally a doctor, and that he was inspired to create Holmes though the example of a certain Dr. Joseph Bell, who was apparently spot on in the art of deducing truths about his patients. Doyle began writing about Holmes in 1887, killed him off in 1893 (thus upsetting readers everywhere), and then brought him back in 1902 and continued with the character until 1927. I did not realize that the writer had killed Holmes off temporarily. He feared that no one would remember him for his other works, which has sort of been the case. As bizarre as the mystery of The Suicide Club, the twists and turns of the dissembling within the Obama administration force us to look for motives, no matter how unbelievable we wish them to be from a President that perhaps protested too much regarding his commitment to “transparency.” This is no longer a partisan issue, as members of both the right and the left are disappointed in this Presidency, albeit for different reasons. We don’t have Sherlock Holmes, but tired congressional inquirers who have their own agendas on both sides of the aisle. Instead, we have to Nancy Drew it ourselves, discern the truth even when we know great lengths have been taken to obfuscate or hide it, an insult to every American, no matter where one’s biases tend to fall. When an official from the IRS pleads the fifth while also pleading innocence, it is hard to think of your government as forthcoming. Call me crazy, but it feels like something is rotten in Denmark. But this is the thing: Sherlock Holmes is always one brilliant thinker eluding the tactics of lesser minds and getting to the bottom of things. He sees things that we miss. We enjoy the show because there is one mystery to solve, and Sherlock Holmes always delivers, with interesting histrionics thrown in for good measure. The problem with this administration is that it is never one thing, never one scandal, never one transgression. It is an arsenal of transgressions and lapses, some criminal, some just embarrassing, but all of which compete with each other and often cancel each other out. They are not solved or resolved; they merely fall into relief by sheer default, being inevitably upstaged by a more current outrage. It would drive even Sherlock Holmes toward more forays into his 7% cocaine solution escapism. Even with Dr. Watson at his side, so many mysteries, and so many potentially culpable parties, might even make Sherlock Holmes want to give up. But if we give into scandal fatigue, throw up our hands and throw in the towel, then we will never really know the truth of any of these situations, and that is a loss for everyone. I can’t get enough of your writing style! Absolutely love it! When I saw you had a new post, I first poured a glass of red then clicked and savored. All I can say is: dead right girl! I think the problem is that politicians used to be “public servants” now they seem to be under the impression that we are their servants. I wish I could see this Sherlock Holmes play. I’m a die hard fan of Sir Arthur Conan Doyle. Perhaps the same people who question the government monitoring data to pick out possible terrorist plots would jump on a president who didn’t protect us from further terrorist plots. Snowden may have been paid or hired by someone for their own dark purposes. Remember, he was one of the monitoring folks before he decided to disclose his info. I am all for freedom from Red Scare tactics, but this episode seems much less than accumulating lists to instigate charges and a kangaroo court. It’s data monitoring data. A machine listening for patterns to protect us. Yes, it will be interesting to see what precipitated Snowden’s decisions…I think that is the frustration of these leaks is that it forces us to determine if monitoring is to protect us, or monitoring that is for other reasons, or monitoring that is not even for unsound reasons, but mishandled. It bothers me that he had so much access and then did not go through the channels open to him to report things that he thought should be questioned….I want to be protected too, but look how easy it was for one loose cannon to go rogue and compromise the system…I think it is a big mess. 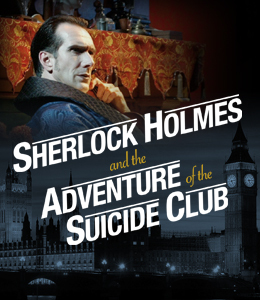 They are going to need more than Sherlock Holmes to unravel all of this…but it is a wonderful show at The Alley! Thanks so much for reading….